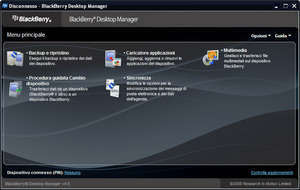 BlackBerry Desktop Manager is a suite of tools for managing and backing up data to and from your BlackBerry mobile phone. The program is an official release for BlackBerry users and provides many of the most important tools for keeping data secure while also providing the ability to interface your PC with your portable BB device such as phone or tablet. The program interface is rather easy-to-use and organizes its features in to vertical tabs: Device, Applications, Organizer and Files. The Media Sync section allows you to synchronize multimedia data such as music, pictures and videos. Version 7.1.0.42 is a freeware program which does not have restrictions and it's free so it doesn't cost anything. For security reasons, you should also check out the BlackBerry Desktop Manager download at LO4D.com which includes virus and malware tests. Additional screenshots of this application download may be available, too.